We are tremendously excited about the new Monchhichi TV show produced by Technicolor Animation (Alvinnn!!! and the Chipmunks, Sonic) and commissioned by TF1. The show is based on the iconic Japanese pop culture figures that have been cherished for three generations, with over 100 millionfigures sold! Created by the famous doll manufacturer Sekiguchi, the Monchhichi made their first appearance in 1974 and quickly took the world by storm. For over 40 years, the dolls have maintained their tremendous popularity, not only with new, young fans, but also with nostalgic adults, who post images of their Monchhichi on all their social platforms. And when we say “post,” think over 100,000 tags on Instagram and thousands of boards created on Pinterest! With such an incredible history and massive success, the time was right for the Monchhichi to have their own new show. Remaining faithful to the original look, we’ve created new CGI characters who have come to life in the cutest fashion. After we learned how incredibly many children keep their Monchhichi close to them when they sleep, we developed a unique story line around children’s dreams. The Monchhichi are their sleep custodians and dream gatekeepers. Monchhidoo is the land where children’s dreams are created. The dreams begin as glowing fruits, which are then stored in the dream tree. As night falls, you can see stars in the sky and glitter falling over each child as they fall asleep. The series targets upper preschoolers with themes developed by Crandall Consulting (Peter Rabbit, Lazy Town, Octonauts, Sesame Tree), which foster the tolerance of individual differences and an understanding of the value of team work. There is no question but that the show will connect with a wide family audience. We love that each character has a unique, adorable personality that kids not only relate to, but take great comfort in. The show also heavily emphasizes the importance of community, as each Monchhichi lives in his or her fun, colorful home, but all work together on their very important task. Although we love them all, we have a special soft spot for the Monchhichi sidekick Monchhinelle, and the old wise one named Sylvus. Their good-spirited attitude also translates into a fun style guide with lots of personality. I mean: can you resist them?? 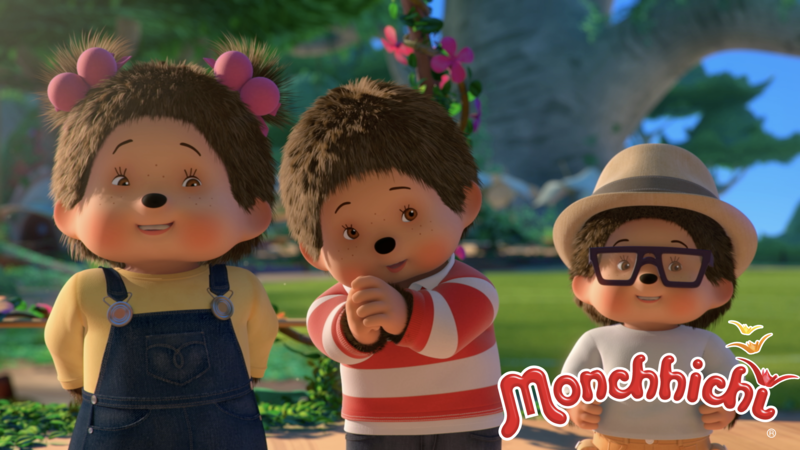 Monchhichi is already set to launch on leading TV channels across the world in 2017, including TF1 (France), VRT (Belgium), RTBF (Belgium), Discovery Kids (Italy), DeaKids (Italy), Canal +Poland (Poland), RTL Telekids (Netherlands), Dreamia Canal Panda (Portugal), AMC Networks (Eastern Europe), NRK (Norway), TeleQuebec (Canada), Discovery Kids (Latin America), MTVA (Hungary), Thai TV3 (Thailand), & More!